Recently, I have received many questions and inquiries about our EDI2XML technology and why it is not offered for “free” like many apps or tools available on the Internet. Just the other day, an acquaintance of mine was contesting that he could find another API for EDI conversion to XML, download it and use it “free of charge”. I decided to write this blog post to share my past experience with free EDI to XML conversion tools and hopefully give you more insight into why a Free EDI to XML converter is NOT a good option for your business. Being an EDI professional, I realize and implement EDI projects. I have encountered many situations where I needed to accomplish urgent and quick results using any code I could find in the moment; library or API that can be downloaded quickly from the Internet for FREE! Everyone likes free things and I am no exception to this. After running the setup program, I hit a few installation errors. I then started the process of identifying these issues, however, I found this process to be very hard, long and tedious since only some of the errors were documented, while most of them were not. In addition, I had to write to the community of the support team. I received a reply two days later, which is a terrible response time if you are in a hurry. We found the issue to be some .NET compatibility between the installer and the operating system I had on my machine. After the long installation process, I was finally glad that my Free EDI converter to XML was setup properly. It was now time to experiment its conversion features. Unfortunately, it wasn’t long before I was disappointed over the fact that this converter had many limitations. It was not converting the EDI to XML based on a format I was expecting. It simply put the XML tags before and after each EDI element and grouped each one of the segments into node. This is not any easier than working with raw EDI. In addition, the tool was not able to convert XML back to EDI. Therefore, the simple features it promised were not even working. I didn’t give up just yet. I then figured that if I can tweak the code through parameters or code modification, it could work. Unfortunately, that was not possible; I had downloaded a “black box” solution where I cannot do any modifications or tweaks to my needs. At this point, I decided to contact, yet again, the community of support as well as the software developer. Unfortunately, the support offered by the developer was an expensive paying option. In addition, if I wanted to customize the engine, I would need to pay a high fee. Bottom line, I wasn’t left with many choices. I had to live with the community support, which was relatively good, but not like any commercial support where response time is on average 2-4 hours. In the end, we hit a wall with the converter. In order for me to reach my expectations with this converter, I would need to pay for a custom job. Once it is custom made, scalability becomes on us, based on how much money we can invest in developing the tool and make it scalable. At this point, I was hesitant, since I would have gone from a Free EDI to XML converter to a very expensive tool. However, if we stuck with the basic free option, then it is quite clear, the EDI conversion tool would not perform, as we had needed. Is it a feasible approach? Having gone through all of the above, we took a step back to reassess what our options were. Should we invest in upgrading a Free EDI to XML converter or should we build it from scratch in-house? We needed to ask ourselves if it was a feasible approach to have a business depend on a free tool, knowing in advance it is a “black box” without support and scalability. Our answer was “NO”. This is when we decided to go ahead with our alternative solution. 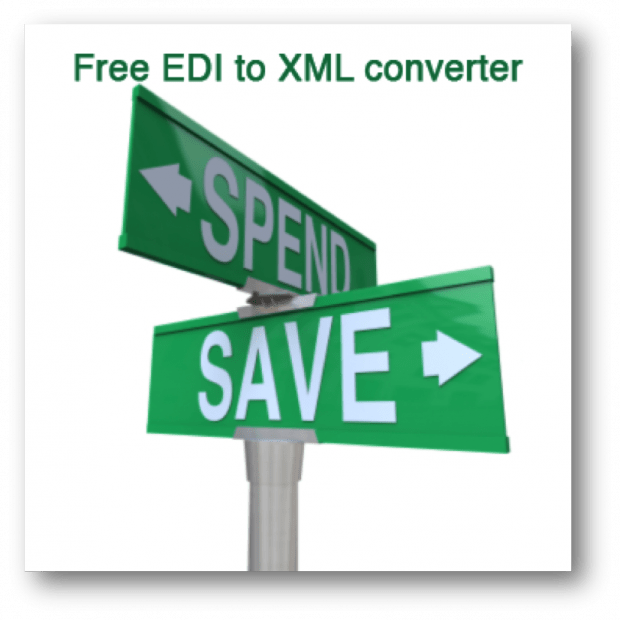 Having spent much time exploring the possibilities of using a Free EDI to XML converter, we came to the conclusion that we would be better off building it ourselves. Our goal was to make it quick, easy, affordable and simple to deploy for us and for our clients with the capability of translating XML to EDI, and vice versa. Other pre-requisites were to ensure scalability and flexibility of EDI2XML as well as the availability of a great support team for EDI2XML. In the end, we succeeded! Our very own EDI2XML solution is offered as a Services and HTTP service for companies of all sizes. EDI2XML Web Service is for developers and businesses, interested in building their own EDI (Electronic Data Interchange) integration flows and programs. Normally, these individuals, are capable of interacting with external API and Web Services to translate EDI to XML and XML to EDI, and have the resources and expertise to work with Web Services and HTTP requests in order to achieve their goals. EDI2XML web service, is the premier choice for IT people as a reliable service to accomplish such Integration projects.